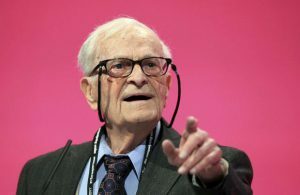 Although he had little formal education, Harry Leslie Smith, who died on Wednesday at the age of 95, became famous for writing and speaking eloquently about Britain’s National Health Service and the human toll of poverty. His own impoverished childhood in Yorkshire and the death of his sister Marion from tuberculosis at the age of 10, “dumped nameless into a pauper’s pit” left him a lifelong socialist and a staunch supporter of the public health-care systems in Britain and Canada, where he moved in 1953. 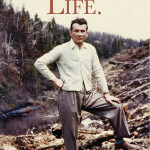 In the last decade of his life, he published five books, one of them – Harry’s Last Stand – selling close to 20,000 copies. He went beyond the written word into the latest technology: He had a quarter of a million followers on Twitter, a podcast and he used a GoFundMe campaign to finance his visits to refugee camps. In 2014, at the age of 91, he gave a speech to the Labour Party Conference in Britain, a dynamic talk that was the hit of the conference and seen thousands of times on YouTube and the BBC online. He read it from a teleprompter, the first time he had ever used that piece of technology, and he mastered it after three short practice sessions. 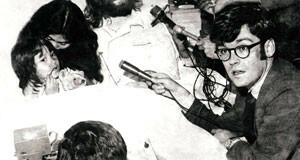 The speech was in front of a huge audience and its opening was dramatic. He said he agreed to speak to the Labour Party conference because there were few people still alive who could remember life without public health care, and he worried that society was taking it for granted. “I felt that I owed it to my sister Marion, whose life was cut short by extreme poverty and poor health care, along with all of those other victims of a society that protected the rich and condemned the poor to miserable lives,” Mr. Smith wrote in the New Statesman. At the time he was known mostly to a cadre of readers of left-wing papers, the New Statesman and the Guardian, but after his speech he found a wider audience. A Labour activist quoted on the BBC called Mr. Smith’s address to the Labour Party Conference a “masterclass” in political oratory. Harry Leslie Smith always used his middle name; it distinguished him from all the other Harry Smiths in the world, although by the time he died he was one of the most famous Harry Smiths in the English-speaking world. Harry Leslie Smith was born in Barnsley, Yorkshire, on Feb. 25, 1923. His father, Albert, worked in a coal mine and was active in the General Strike of 1926, when millions of workers, in particular in Northern England, went on strike. The strike failed, and wages were cut. Eventually, his father was injured and couldn’t work in the mines. The family moved to Halifax (in Yorkshire) and lived in extreme poverty. “At the age of seven, I became an afternoon barrow boy and plied a cart filled with beer bottles down despair-filled cobbled streets. I delivered ale to those in my neighbourhood looking for a short respite from their diminished lives, which were being suffocated by the Depression,” Mr. Smith wrote. While he worked to help feed his mother, Lillian, his one surviving sister and his half-brothers, his schooling suffered. “At the age of 10 I was helping to deliver coal, and by my teens, I started work as a grocer’s assistant. At 17 I had been promoted to store manager. However at 18, the Second World War intervened,” he wrote in the New Statesman. Mr. Smith joined the Royal Air Force in 1941. He was in a wireless operations unit that trained for a role after the D-Day invasion of Europe. 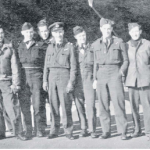 His unit worked to make captured German airfields useful for the Royal Air Force and other allied air forces. He always said he had a good war, in that he was never hurt or wounded. “I had walked away from it without needing so much as a plaster for a shaving nick,” he wrote. The refugee crisis in Europe, just before and after the end of the war, had a profound effect on him. “The starvation he saw in Holland after the Hunger Winter overwhelmed him, a deliberate policy of inhuman cruelty,” his son John said. In 1945, Mr. Smith was still in Germany when he voted for Labour in the British election that defeated Winston Churchill and brought in Clement Attlee and the Labour government that introduced the National Health Service. He stayed in Europe for almost three years after the war as part of the occupation forces, working with refugees as well as helping with air-traffic control at an airbase outside Hamburg, which was next door to a refugee camp. While he was stationed in Hamburg, he met and married a German woman, Elfriede Edelmann. When they moved back to England in 1948, Mr. Smith worked at the Halifax Mackintosh toffee factory, pushing a cart and cleaning the giant vats. In the evenings, he and his wife went to night school, as part of a government program to encourage adult education. He then got a job working for Humphrey’s Carpets, operating a giant loom. It was a job that prepared him for work in Canada, where he and his family moved in 1953. They settled in Toronto, and Mr. Smith worked in the carpet department of Eaton’s department store and then worked as a manager of an Oriental carpet store in downtown Toronto. Because of his work, he travelled to England and other countries. All the while he kept his social conscience alive, doing things such as marching in anti-apartheid demonstrations in Toronto. Mr. Smith never joined a political party in Canada, but his son says he was a fan of Pierre Trudeau because of his multicultural policies, and in spite of Brian Mulroney being a Conservative, Mr. Smith approved of his fight against apartheid and his support of Nelson Mandela. After retiring, Mr. Smith became a caregiver for his wife, who had rheumatoid arthritis, and his son Peter, who had schizophrenia. After his wife’s death in 1999, he started spending half of the year in Canada and half in England. 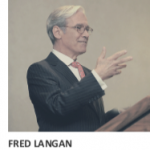 He had been writing – his first freelance article was published in The Globe and Mail – but he found an receptive audience in Britain. For a man who left school at 14, and who had been a child labourer before then, he was an amazingly talented writer. His son says he was first published when he was 87. 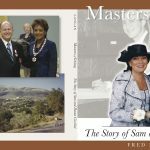 In the past decade, Mr. Smith became the subject of newspaper articles, TV documentaries and radio profiles. Many people were attracted to his strong, simple message. “He’s just a decent human being, an ordinary guy who does extraordinary things,” said his son John from the hospital in Belleville, Ont., where he stayed by his father in his final days. Mr. Smith leaves his sons John and Michael, and two grandsons, Matthew and David. He was predeceased by his wife and son Peter.